A dam’s reservoir acts like a repository for sediments otherwise destined for downstream landforms or the river’s terminus at the sea. As moving water hits these still pools, it decelerates and drops the gravel, sand and silts it was carrying. Most large dams trap and retain 98 percent of their river’s sediment, thus holding a nearly complete material history of the system’s work. Further compounding that load, reservoirs retain additional quantities of sediment caused by increased rates of landscape erosion induced by mining, farming, deforestation and urbanization. Via these surface alterations, the rate at which soil slips from land to sea has exponentially increased. In the United States, ‘geologic’ erosion shears off only about 30 percent of total continental sediment, while ‘accelerated’ soil erosion from human influences accounts for the remaining 70 percent. 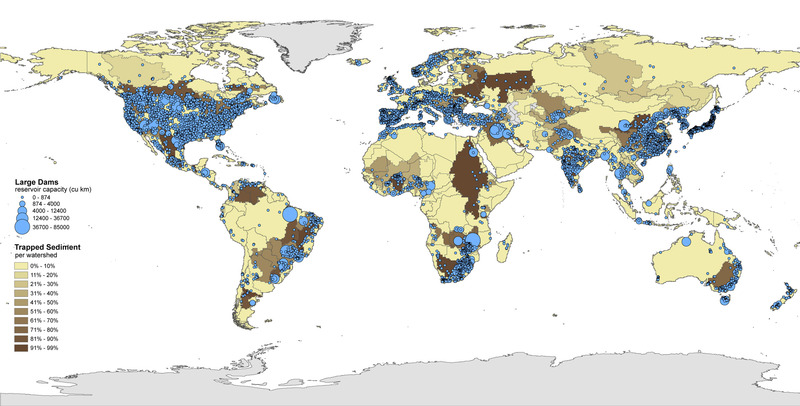 A world inventory of large dams (above) reveals their global distribution to be lumpy, uneven, and politically patterned. Large dam infrastructure typically emerges not only where harvestable rivers are located, but also where pulses of economic incentive and industrial development are occurring. In contrast to nations like India, Brazil and China, the United States is no longer building lots of large dams. The U.S. era of big dam construction took hold around 1940 and reached its peak in the early 1970s. * Today, funding for such projects is not as politically feasible, and more poignantly, most prime locations for dams have already been utilized – a condition know as “site depletion”. Thus the United States is a thoroughly dammed nation, wherein most of its high-flow rivers and opportune canyons are already occupied by strategic barricades of earth and concrete. Consider that the U.S. Army Corp of Engineers currently tracks 84,134 significant dams in its National Inventory. In the U.S., design efforts are more focused on retooling, retrofitting or decommissioning the infrastructure. In contrast, China currently leads the world in dam construction, both in quantity and size. The nation also has one of the highest rates of continental erosion and is estimated to be losing its soil at a rate fifty-seven times faster than it can be replaced. 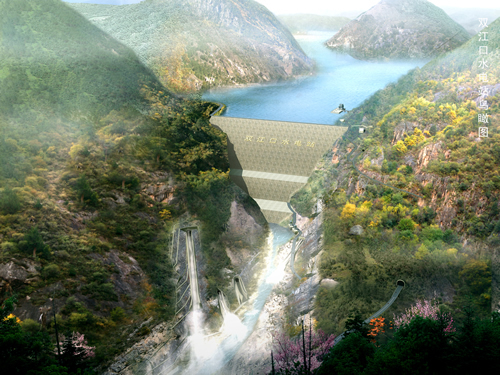 * At the same time, its super-scaled infrastructures, like Three Gorges Dam, stores approximately 170 million tons of the Yangtze River’s sediment per year, reducing sediments reaching the Yangtze’s coastal delta by as much as 82%, with profound impacts on the morphology of estuary, delta and coastal waters to be expected. * To better situate that agency at a tectonic scale, prior to the dam’s construction the Yangtze river was the world’s fifth largest river of sediment, constituting 4% of all global sediment discharged to the oceans every year. Taken together, these opposing sedimentary trajectories and collision spaces beg for an interdisciplinary team of designers, political ecologists and speculative hydrogeomorphologists to run scenarios on China’s forthcoming continental structure; a futurism running on radically altered sedimentary budgets, landscape financialization and dam racing; wherein they might encounter peak soil trends merging with a more considered choreography of hydroelectric catch basins. Seen as an aggregate collection of hydro-geological megaforms, dam infrastructure is a tectonic body of sorts, with its own migration patterns and reservoir-induced earthquakes. Perhaps this dispersed geographic network of monumental slabs of concrete, stilled water, turbines, and masses of sediment is a provisional example of a hyperobject. As conceived by Timothy Morton, hyperobjects are things like global warming and plutonium 239 that defy local circumscription and bounded temporality. Like dams and their decelerated rivers, they are “massively distributed in space-time.”* They are viscous, squishy, and uncanny things we cannot escape, outlive or distance ourselves from. The extremity of our co-intervention in the circulation of water and sediment seems matched by the extremity of the notion that our agency can be fully removed from them.